Center for Biological Diversity echoes Richardson's outrage over killing rare Mexican wolf Milford Flat fire in central Utah burns 160,000 acres in one day! Clean air gone for the summer in Idaho? With the onset of the thunderstorm season in parched southern Idaho, the clean air is probably gone for the summer. I took the photo below June 9this year. It is of the Lost River Range from Copper Basin. It is very hazy today in Pocatello, Idaho today due to all the wildfires lightning ignited yesterday. Just got a call from Stanley — very smoky there too. You can check for air clarity by clicking on the web cams I have linked to. I notice today that a number of them show degraded air quality. The air may not be this clear again until late September. The photo is a medium telephoto. Photo copyright Ralph Maughan. Lost River Range. East Central Idaho. 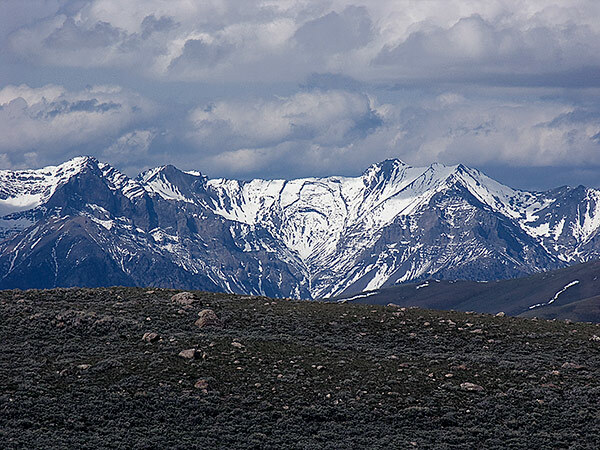 This is a telephoto shot taken from Copper Basin. 4 Responses to Clean air gone for the summer in Idaho? I have never been more concerned about an environmental issue in my life. It is the aerosol spraying program that our goverment it doing (some call it “chemtrails” – not an accurate term). Maybe it is not big in Idaho yet, but I see it in almost every place I visit. If there are 4-5 planes at once laying them down, the whole sky will be a mess in an hour or two. Do these fine particles magically disappear? No! That’s why our visibility is so bad everywhere!! Please learn about this issue and contact your representatives. This is the biggest threat to our environment and your personal health. You could be right on the money Ralph, I talked to a guy that works fires for the Payette Nat’l this AM — he said they have at least 15 “spots” going on the West side after the lightning on Thurs. Going to be a long hot summer. 19 fires just started on the Bitterroot from lightning. Ouch. Looks like the entire area could use some relief from the heat, and some rain. Yes, we’ve had some record heat in Montana. Supposedly it hit 107 yesterday in Missoula. Since I don’t use AC in my apartment, I can certainly believe it.